17-year-old Freyja is outspokenly lesbian and politically active about LGBTQ issues at her school’s Gay-Straight Alliance. When her girlfriend Rachel breaks up with her, she suspends her work on the online video blog they created together to celebrate their pride. Instead she starts volunteering at the local food bank. But she can’t figure out why the team leader at the food bank, a guy named Sanjay, doesn’t seem to approve of her.Freyja learns about food justice, and becomes attracted to Sanjay’s passion for the cause. As her friendship with Sanjay grows, she realizes that they connect in a way she never did with Rachel. But can Freyja be in love with Sanjay if she identifies as a lesbian? When members of her school’s GSA assume that Freyja has “gone straight” and oppose her leadership of the group, Freyja has to choose between sticking with her old idea of herself — and taking a chance on love. As someone identifying as bisexual, it’s important for me to read more unknown LGBTQIA+-books as well. One of those books is You’re You by Mette Bach. This isn’t just an ordinary contemporary though, so let’s dive into my review! Like I said, this isn’t a normal contemporary. 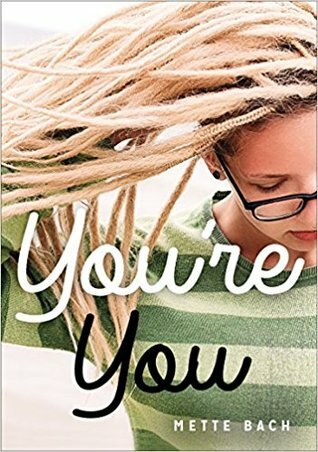 You’re You is a hi/lo title, intended for struggling and reluctant readers. This means the pace of the story is higher than what most of us are used to – or even better: than what most of us prefer. It also means the vocabulary used is simple. All these things made reading this novel that more special. I honestly expected the quick pace to get on my nerves because there was bound to be some form of insta-love, but I’m happy to say it didn’t. I liked how the story progressed, even with the obvious fast pace. As for the subjects touched upon, there’s mention of food accesibility, which plays a huge role in how Freyja and Sanjay meet. Apart from that, there’s obviously the focus on the LGBTQIA+-spectrum. I love how this novel conveys the message that sexuality is fluid. It isn’t because you identify with a specific label at first, it cannot be adapted later on. It can. Reading that in a story is refreshing and much-needed. I don’t think I’ve ever read a novel where characters go from one LGBTQIA+-label to another one. I dare say we need more of those! Honestly, because it’s a hi/lo novel, the pace is up there and I think that had an obvious impact on the character development – or lack thereof. I would’ve loved more fleshed out characters but I realize that’s a hard thing to accomplish in such a short.. page-span. It’s just the way I prefer things, but I also accept the fact that struggling – or reluctant – readers might prefer this novel over more worked out ones. I honestly hope there’s a novel like this one out there somewhere with more of a regular pace and fleshed out characters – simply because I want a novel like that for “regular” readers as well. You’re You conveys an important message and for that, I absolutely adore it. When it comes to the munches, you have no idea how stoked I was! Marble cake! I absolutely love marble cake but had yet to make it myself so this was.. well.. perfect. Have you ever read about a novel where someone ends up changing their label? Would you want a novel like that? ‹ PreviousOVER-AMBITIOUS TBR for the Magical Readathon: Getting my N.E.W.T.s! Next ›CRAZY TBR – ARC August, N.E.W.T.’s and the BookTubeAThon! I don’t think I’ve ever clicked on a review faster than I did when I saw the title of this one. This book sounds sooo good! The hi/lo thing makes me a bit reluctant (also, it’s the first time I hear about it so okay), but I’m thinking of checking it out. I’m so glad to see the fluidity of sexuality being represented! !